You inspired Alex Briggs (NMC ’18, center) to give backAlex Briggs (NMC ’18) found it nerve-racking to attend the Induction Ceremony for NMC’s chapter of the Phi Theta Kappa (PTK) Honors Society last spring. She found it so unnerving, in fact, that she almost didn’t attend. Looking back now at that shy, anxious student, Alex is surprised at how much she’s grown in just one year. 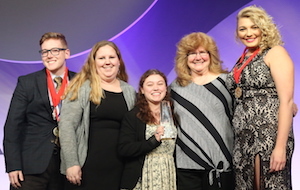 Alex was instrumental in her PTK chapter winning multiple awards at the national convention. She gave a speech at the NMC Commitment Scholarship Induction Ceremony. And, most recently, she ran for Secretary/Treasurer of the Michigan Region of PTK—and won. Alex is relieved that her nerves didn’t stop her PTK journey before it even began. And, she knows that other students eligible for PTK may not join because of their own barriers—often the membership fee. To make sure everyone has access to PTK, Alex made a personal gift to the NMC Foundation that will cover the membership fee for two future students. It was YOUR gifts to the NMC Foundation that inspired Alex to make one of her own. As a volunteer for the NMC Foundation’s Student Philanthropy Initiative, Alex learned that the majority of NMC Foundation donors make gifts between $10 and $50 every year. “I’ve received scholarships from the NMC Foundation. It means a great deal, and not just financially. It means someone wants you to succeed,” said Alex. Alex describes her PTK experience as “the gift that keeps on giving” because it’s given her much more than she expected: confidence, leadership skills, and friends that feel like family. Your gifts to the NMC Foundation keep on giving, too. They give the precious gift of education. They give students a chance at a better life. And, they inspire students like Alex to pay your generosity forward.